Weidmüller Omnimate Data range of RJ45 jacks offers modular designs customisable for all your needs. They are available in varieties suitable for SMD, THT or Wave soldering, latch-up and latch-down designs, as well as a choice of 90° and 180° entry, and have been specially designed to use as little board space as possible. Browse for the connectors available from stock below; other models are available at short lead times if required. Can't find what you're looking for? Contact us, a further extensive range of options and custom designs are available upon request. Our sales team will be happy to find the right solution to meet your needs or arrange samples if required. The RJ45C5 R1V 3.2N4G/Y TY connector from the Weidmüller Omnimate data range, offers a connector system with an eight-pole miniature plug-in system for use in connections with STP and UTP cables. This Weidmüller RJ45 jack features an outgoing elbow of 180° with an extended temperature range of −40°C to +85°C and a solder pin length of 3.2mm. For further information regarding the specifications, please see the datasheet on the Technical Library tab. The RJ45C5 T1D 3.2E4G/Y TY connector from the Weidmüller Omnimate data range, offers a connector system with a twelve-pole miniature plug-in system for use in connections with STP and UTP cables. This Weidmüller RJ45 jack features an outgoing elbow of 90° with an extended temperature range of −40°C to +85°C and a solder pin length of 3.2mm. 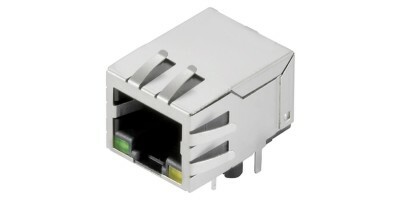 The RJ45C5 T1D 3.2N4N TY connector from the Weidmüller Omnimate data range, offers a connector system with an eight-pole miniature plug-in system for use in connections with STP and UTP cables. This RJ45 jack by Weidmüller features an outgoing elbow of 90° with an extended temperature range of −40°C to +85°C and a solder pin length of 3.2mm. The RJ45C5 T1D 3.3E4N TY connector from the Weidmüller Omnimate data range, offers a plug-in connector system with an eight-pole miniature plug-in system for use in connections with STP and UTP cables. This RJ45 jack features an outgoing elbow of 90° with an extended temperature range of −40°C to +85°C and a solder pin length of 3.3mm. The RJ45C5 T1U 2.8E4G/Y TY connector from the Weidmüller Omnimate data range, offers a connector system with a twelve-pole miniature plug-in system for use in connections with STP and UTP cables. This Weidmüller RJ45 jack features an outgoing elbow of 90° with an extended temperature range of −40°C to +85°C and a solder pin length of 2.75mm. The RJ45C5 T1U 2.8E4N TY connector from the Weidmüller Omnimate data range, offers a connector system with an eight-pole miniature plug-in system for use in connections with STP and UTP cables. This Weidmüller RJ45 jack features an outgoing elbow of 90° with an extended temperature range of −40°C to +85°C and a solder pin length of 2.75mm. The RJ45C5 T1U 2.8N4N TY connector from the Weidmüller Omnimate data range, offers a connector system with an eight-pole miniature plug-in system for use in connections with STP and UTP cables. This Weidmüller RJ45 jack features an outgoing elbow of 90° with an extended temperature range of −40°C to +85°C and a solder pin length of 3.2mm. The RJ45C5 T1V 3.2N4G/Y TY connector from the Weidmüller Omnimate data range, offers a connector system with a twelve-pole miniature plug-in system for use in connections with STP and UTP cables. This Weidmüller RJ45 jack features an outgoing elbow of 180° with an extended temperature range of −40°C to +85°C and a solder pin length of 3.2mm. The RJ45C5 T1V 3.2N4N TY connector from the Weidmüller Omnimate data range, offers a connector system with an eight-pole miniature plug-in system for use in connections with STP and UTP cables. This Weidmüller RJ45 jack features an outgoing elbow of 180° with an extended temperature range of −40°C to +85°C and a solder pin length of 3.2mm. The RJ45C5 T1V 3.2N4N TY plug-in connector system is part of the Omnimate Data range from Weidmüller. The RJ45C5 T1V 4.0N4N TY connector from the Weidmüller Omnimate data range, offers a connector system with an eight-pole miniature plug-in system for use in connections with STP and UTP cables. This Weidmüller RJ45 jack features an outgoing elbow of 180° with an extended temperature range of −40°C to +85°C and a solder pin length of 4mm. The RJ45C6 T1U 2.7N4N TY series from the Weidmüller Omnimate data range, are a plug-in connector system with an eight-pole miniature plug-in system for use in connections with STP and UTP cables. This Weidmüller RJ45 jack features an outgoing elbow of 90° with an extended temperature range of −40°C to +85°C and a solder pin length of 3.2mm. The RJ45C6 T1V 3.8N4N TY connector from the Weidmüller Omnimate data range, offers a connector system with an eight-pole miniature plug-in system for use in connections with STP and UTP cables. This Weidmüller RJ45 jack features an outgoing elbow of 180° with an extended temperature range of −40°C to +85°C and a solder pin length of 3.2mm.